← Stinging Nettle Spanakopita . . . or should that be Nettlekopita? It’s mango season. 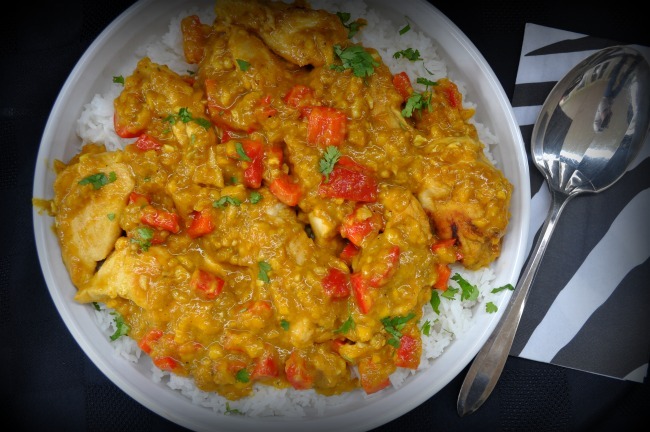 Celebrate this odd-looking, difficult-to-cut-until-you-learn-the-technique fruit by making this sauce to serve with chicken and Thai rice. It has a perfect balance of sweet and sour, salt and spice. Click here to see how easy it can be to cut a mango. Place all Mango Sauce ingredients in a food processor. Process until more or less smooth. This sauce can be made ahead of time and refrigerated. Cook the rice in water or broth, following package instructions. Stir the flour and salt together and place in a mixing bowl. Add the chicken pieces and turn or gently stir them to coat. Heat a wok or frying pan over medium-high heat. Add the oil, then begin frying the chicken pieces. Fry 3-5 minutes per side, or until light golden brown and cooked through. Remove chicken from pan and set on paper towel, or a clean surface. Wash out the pan, or use another clean one. 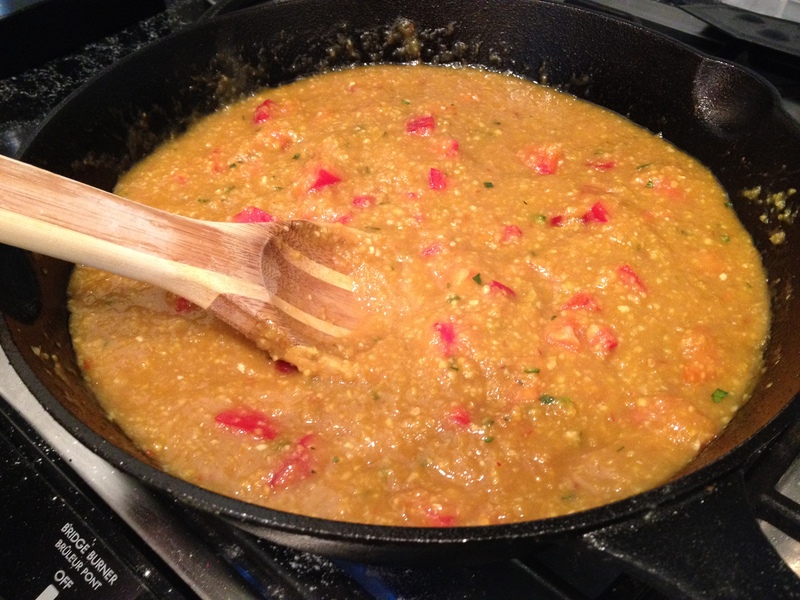 Set over medium-high heat and add the mango sauce and the chopped red pepper. Bring to a gentle boil, then reduce to a simmer. If sauce becomes too thick, add 3-4 Tbsp. water or coconut milk. Simmer 3-4 minutes, or until pepper has softened slightly but is still tender crisp. Add the fried chicken pieces, gently stirring them in to cover with sauce. Add the reserved mango chunks and simmer just until heated through. Transfer to a serving dish. Sprinkle with fresh cilantro and serve with plenty of Thai jasmine-scented rice. 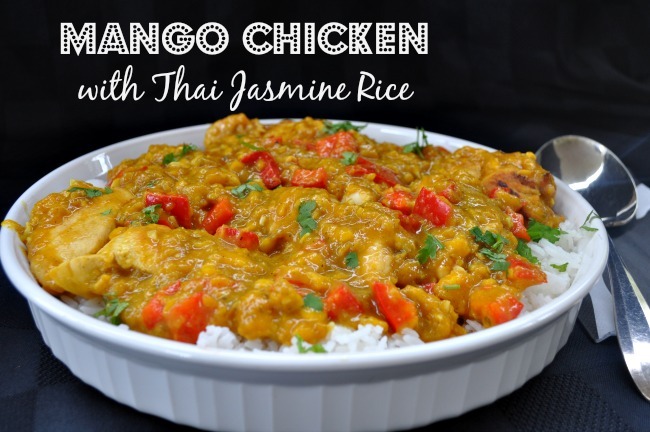 This entry was posted in Chicken, sauce and tagged chicken and rice, mango chicken, mango sauce, Thai chicken, Thai chicken and rice, Thai jasmine rice. Bookmark the permalink. This looks so delicious. Yum! Wow…this does indeed looks delicious. We bought a flat of mangoes a couple of weeks ago and I think there is one left – I’m going to try and stretch it to make a small batch of this recipe. Thanks for posting!! You could easily substitute other sweet fruit, like pineapple to stretch it. Good luck!